What can you tell us about your new release Lifelines? 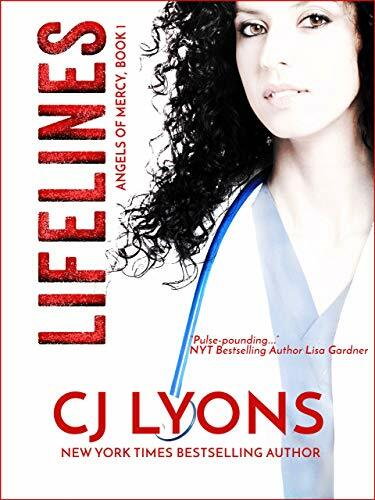 Lifelines is the first book of the Angels of Mercy series and starts out on the most dangerous day of the year… July first, the day the new interns begin to work at hospitals, knowing nothing more than they did when they graduated from med school but now, suddenly with real lives at stake, resting on their skills and decisions. As a pediatric ER physician, I used not only real-life medicine throughout the story, but also called upon my own experiences, including the emotional rollercoaster that is life in the ER. I’ve been a storyteller all my life—used to get me into trouble all the time when I was young. I wrote my first novel (a YA fantasy) when I was 15 and two science fiction novels while in medical school. Writing is my way of making sense of the chaos surrounding us. And I never needed it more than during my pediatric internship when one of my fellow interns was brutally murdered. The escapism of SF/F was no longer enough for me. After his death, I needed to understand good and evil, needed justice, needed an outlet for my grief and bewilderment. And so, I wrote my first thriller and discovered the healing power of exploring not just the black and white of good/evil or justice/injustice, but more importantly the gray areas between—those areas where faith and humanity are truly put to the test. Thanks for giving me five! Usually when I’m asked this question it’s only one or three—even five isn’t enough for someone like me who reads constantly. Whenever I answer this question I treat “best” as meaning books I’d sell my soul to have written—and usually the answers are never the same. I’d have to include Ray Bradbury’s Something Wicked This Way Comes—I first read it as a kid and still re-read it almost every year. Bradbury taught me the magic of individual words used to seduce a reader to enter a strange new world; the way he combines poetry with the prosaic still amazes me. Mark Helprin’s Winter’s Tale makes the list for the same reasons. It’s the first novel I devoured as a reader then went back and tried to analyze as a writer. Also on the list is Bill Waterson’s Calvin and Hobbes—yes, they aren’t novels, but they pack a hefty amount of world building and vision (not to mention emotional themes and humor) in only a few words! I’m always discovering new authors whose voice I admire. Three of my current favs are Pierce Brown’s Red Rising series, Laini Taylor’s Strange, the Dreamer, and Katherine Arden’s masterful Winternight trilogy. Okay, that’s more than five, but math was never my thing! Shakespeare! (okay, we’d need a TARDIS to make that happen) I’d want to know who his Dark Lady was (the muse he dedicates many of his plays to) and how he developed his techniques of audience manipulation—because, let’s face it that’s what good storytelling is all about, whether it’s a thirty second Super Bowl commercial or a thousand page saga, we’re in the business of convincing the audience to suspend their belief in reality and join us in a new world we’ve created for them. My favorite thing about writing is that act of creation, taking the voices in my head and being able to bring them to life on the page. But my favorite thing about being a writer is definitely the reaction of my readers to my stories. Being able to touch so many lives (I’ve sold almost three million books) is both humbling and awe-inspiring. I get readers writing to tell me that for the first time they spent a night free from cancer pain because they were so immersed in one of my stories. Or readers of the Hart and Drake series (which deals with an ER doctor who leaves a violent marriage) who write to thank me for giving them the courage to get help and escape their own abusive relationships. People always ask me if I miss medicine and saving lives…I do, but I’ve come to realize that through my writing I have the chance to impact more lives than I ever could as a doctor. Being a writer is a lot like my former career as an ER doctor—no two days are the same! Only with writing, instead of being at the beck and call of a cell phone, trauma radio, or schedule, I get to set my own pace for each day. I love that freedom! What scene in Lifelines was your favorite to write? It’s a short scene, but pivotal in terms of building the main character’s authority and emotional stakes. In it, Lydia, my main character, has been suspended from her position as an ER attending physician after being accused of causing a patient’s death. But she has a ridealong with an EMS squad scheduled and is the kind of person (a lot like me and many ER docs, lol!) who simply can’t sit at home doing nothing, so she goes out with the squad as an observer, despite being forbidden from any hands-on patient care. This scene was a ton of fun because I used a lot of my own experiences working with first responders—from the banter to the actual trauma run, a multi-vehicle pile-up on a freeway where Lydia chooses to risk her career in order to save a life. For my writing life it’s simple: No Rules, Just Write! I’ve published forty-four books and no two have been written in the same way—in fact, ISOLATION, the finale of the Angels of Mercy series (LIFELINES is book one), was written scene-by-scene backwards! I knew who lived and who died at the end and so worked back from there. It was sooooo much fun to write that way, like skipping along a highwire without a safety net. Drove my editor crazy, but I think it allowed the book to both surprise and delight readers who’d invested so much of their time and hearts with the women of Angels of Mercy.